Thanks to the generosity of a friend, my family and I spent a long weekend on Fontana Lake. The small “fishing” cabin near Prince’s Boat Dock is not the Ritz but it has all the comforts of home and a lot more character than the Ritz. Many of you who follow the “Naturalist’s Corner” might know that I am a “lake rat” from the Delta of northeast Louisiana. I spent much of my misspent childhood and adolescence in a shotgun shanty on Horseshoe Lake at the edge of the Beouf River Swamp. All I have to do is open the door to the Fontana cabin and I’m nearly bowled over by the nostalgia that pours out. Now, of course, that nostalgia is mine. But on these excursions, and others into nature, I can see nostalgia working its way into Izzy’s (12) and Maddie’s (8) psyche. They don’t see it. I didn’t see it when I was 12. But I watch them chasing fireflies, or collecting the tiniest of toads (some with the stub of a tadpole tail still attached,) or trying to corral a fence lizard, or paddling a kayak, or listening to the hurried call of a whip-poor-will in the darkening dusk and I see it creeping in. Some of us had a longer weekend than others. Izzy was taking a writing course at UNCA and had to be over there Monday through Friday. But when I worked off Thursday morning Maddie and I loaded up and headed for the lake. Since I was a bit sleep-deprived we didn’t get into the water. We went down and kicked around on the dock till a thunderstorm sent us back to the cabin. Maybe it was the cool breeze and darkening clouds, but as we started to the cabin we saw hundreds of tiny toads hoping about. By tiny, I mean less than a half-inch in length. The numbers were startling but created a great biology lessons. Those creatures in the wild that offer no or little parental care produce large numbers of offspring and only a small percentage make it to adulthood. On the other hand those creatures that care for and nurture their offspring have fewer but there’s a greater chance for survival. After the thunderstorm and a short nap we went back down to the dock to watch night fall. A whip-poor-will, right across the channel, shook the tranquil setting with its loud incessant rapid-fire whip-poor-will – whip-poor-will – whip-poor-will! When we got back up the steps to the yard it was nearly dark and the yard would erupt in a blue-green flash, then go black only to erupt again in about 10 seconds. The synchronous firefly, Photinus, carolinus, was holding court. These bugs are nearly done with their annual display but they were still in full force last weekend. The next morning we hit the lake in our kayaks. Maddie was paddling a small sit-on boat and she never missed a stroke. After about a half-hour of paddling we hit the water. We went for another longer paddle that afternoon and got to watch a green heron catch its dinner. Izzy and Mom arrived late Friday afternoon and we were in the water again till nearly dark. 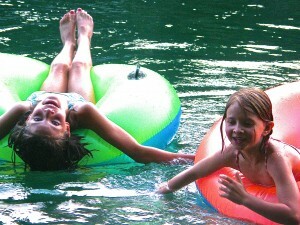 In fact, until we left Fontana Sunday afternoon, if it wasn’t night or meal time the kids were in the lake. I think I see gill slits developing.